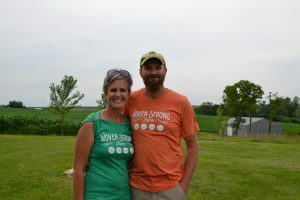 On June 28, twenty nine people gathered on Bill and Stacey Borrenpohl’s farm near LaMotte, Iowa. 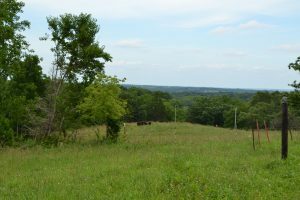 After much planning and patience they bought this property to raise their family and provide meat for themselves as well as their community. They purchased the eight acre farm in 2011, and started farming in 2012. Their planning process helped them understand the importance for building infrastructure on their farm. In order to find balance between farm living and making a profit, they knew they had to have an efficient system. Field day hosts Bill and Stacey Borrenpohl. The field day started in their open-front barn up upon the ridge. Bill pointed out that having multiple species on their farm means they must think seasonally about how the barn is used. Through the winter months the livestock all shares the barn for protection from the elements. In late April kidding and calving begins, the barn is then filled with pens to keep the new babies dry and warm. By birthing at this time of year, they are able take advantage of early pasture growth and avoid weather extremes. During the summer months the goats and pigs get the run of the barn while the cattle stay out on the pastures. Inside the barn, Stacey shared how they market their meat products direct to their customers. They have found that focusing on selling halves and wholes fits their needs. Occasionally they will sell beef and pork by the cut at select marketing opportunities. Their customer’s wants paired with their values is what drives them to raise livestock the way they do. One example of this is feeding a little non-GMO grain to their steers. The customers enjoy the flavor and value the non-GMO source of the grain, while Bill sees a decrease in time to market. Stacey shared the challenges with direct marketing meat to consumers. “Marketing is easily the hardest part we do, producing not as much, finding buyers for all the meat is the hardest part.” The customers haven’t been the only ones to drive their marketing efforts. Bill and Stacey have found that selling through farmer’s markets is not ideal for them. The time commitment of doing a weekly market just doesn’t work for their family. After leaving the barn the walking tour began, moving through a number of the paddock to see the rest of the infrastructure that they have built. Knowing fencing is expensive Bill and Stacey focused on making sure the perimeter fence around the goats is goat-friendly. This means the exterior fencing is woven wire with openings that are large enough for goats to pull their heads through without hanging from their horns. Much of the interior cattle fencing is single strand 4 mm poly-wire. Bill describes the steps Stacey using to move the goats onto new pasture. This holds the steers and cows in place while rotating though pastures. Because the cows are easier to contain using the single-strand poly wire Bill is able to graze some neighboring waterways and headlands. Having this friendly agreement with his neighbor allows him to have more grazing ground while his neighbor benefits from additional grass and brush maintenance around his crops. “He’s just spending time and diesel to cut grass that our cows can definitely eat,” shared Bill. Bill and Stacey graduated from Practical Farmers’ Savings Incentive Program in 2016. They decided to use part of their payout to purchase a utility ATV “Mule.” This piece of equipment has proved very helpful in moving temporary fencing when setting up new paddocks and moving hoses and supplies for watering systems. While moving through the paddocks Bill pointed out the black pipelines that move water into the paddocks. Installing these lines make easier work of moving waters as the livestock rotate from one area to another. When reflecting on moving hoses before the new water lines Stacey shared: “We do lots of improvements; this is one of my favorites in recent years because the kids and I do help a lot, and those hoses are heavy, like really, really heavy. When you are moving five or six of them before we had the Mule, draping them on a little kid and watching them carry them looking all sad and hot.” Now Stacey and the kids can easily help out and move waterers with much ease. During the winter months the livestock all move near the barn to an area Bill calls the sacrificial pasture. All the paddocks are used to complete rotations and build soil health. The sacrificial area is used when rotations can’t be done or would damage the soil. During the winter all the cattle and goats use a shared waterer. The hogs have their own, meaning only two waterers that need to be heated and maintained in the bitter cold months of winter. Ridge-top view from Woven Strong Farm. 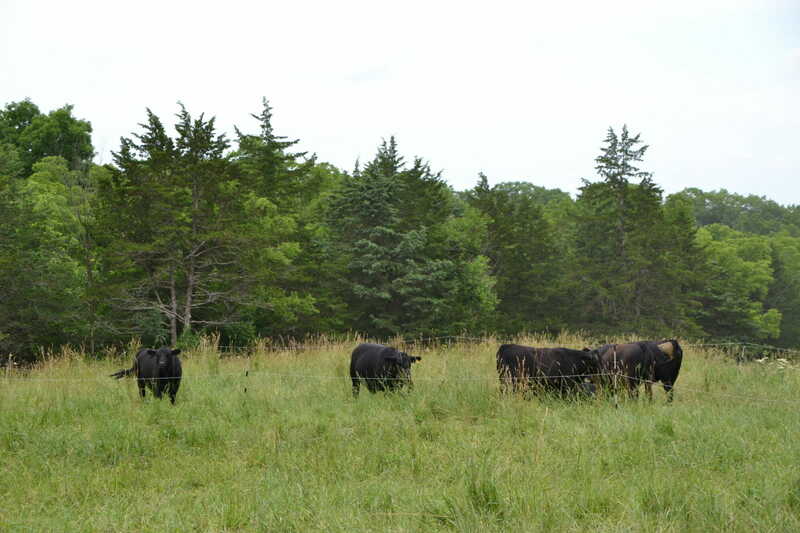 In 2013 Bill and Stacey started grazing the main pasture to the northwest of the barn. The first year they started continuous grazing cattle. By August they were low on pasture and feeding hay. Realizing this wasn’t a sound system they started to attend field days offered through Practical Farmers to see other systems of grazing. This is when they discovered rotational grazing. In 2014 they implemented this process and continued to research more about rotational methods. When starting the 2015 season it was evident, even with rotational grazing they were still overgrazing. By adjusting practices and interseeding other forages into the current grasses they improved their system. Now they maintain some red clover by frost seeding in areas where needed. During winter months they use bale grazing to feed during cold months and to build organic material in areas low in organic matter. This is done by staging 12-15 hay bales along the ridge and feeding on one bale at a time. When one bale is finished you move the fence behind the next bale, continuing to do this until the bales are gone. This adds organic material with remaining hay and manure on the top of the ridge, building better soil for the future. Steers grazing on Woven Strong Farm among the cedar trees. The farm was very woody when Bill and Stacey started farming. One example is the invasive cedar trees that had overtaken potential grazing ground. Bill has been slowly working at removing these trees mechanically and milling the lumber to use on projects around the farm. Other areas that require some restoration include the steep sloping area along the road. This is the area where the goats have been used to control other invasive brush, like multi-floral rose. Bill finds working with nature effective and enjoyable. “It’s really peaceful to watch them [goats] graze. It’s so interesting to watch them nibble and they’ll come over there and then go over there, you’re watching nature work. It’s really interesting how they do it, then they will come back the next day on the same plant,” shared Bill. Many of the improvements that Bill and Stacey have done on their property have been through the help of programs offered through the USDA. Lori Schnoor, their local Natural Resource Conservation Service agent, has helped Bill and Stacey use these programs to make improvements on their farm. 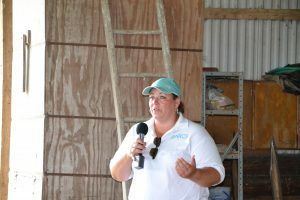 At this field day Lori shared many of the programs offered by NRCS, such as the Environment Quality Incentive Program. This program provides cost-share to implement infrastructure to encourage conservation practices such as pasture seeding, interior fencing and supplies, or watering systems. Bill has used this program to run water lines and improve forages in the grazing paddocks. Lori Schnoor, District Conservationist sharing NRCS programs with field day attendees. Partnerships have helped Bill and Stacey create a farm that meets their family’s values, works with nature, and delivers a great product to their customers. 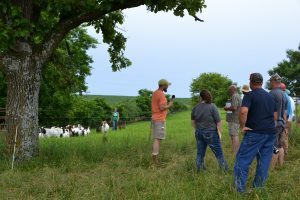 These partnerships include participation in NRCS programs, working with neighbors, and networking with other similar farmers. Bill and Stacey have found great value in building a network of people in their community and beyond to keep their farm going.